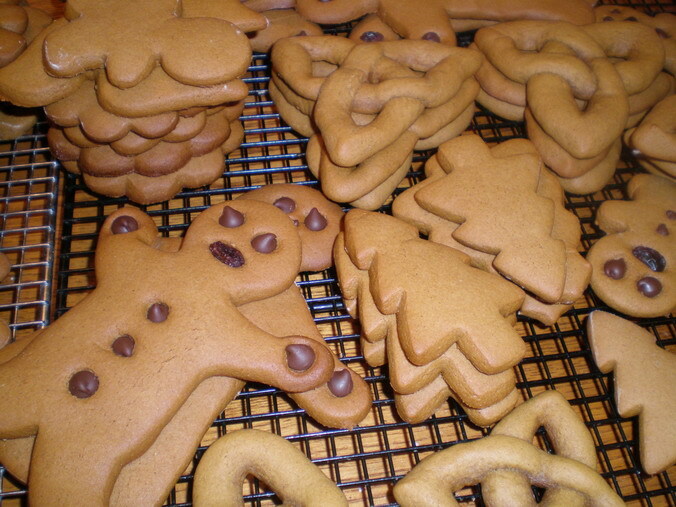 It wouldn’t feel (or smell) like Christmas without the smell of gingerbread cookies freshly baked, wafting through the house. This is a great recipe to make with your kids as the dough is extremely forgiving and handle-able. Some cut out doughs you aren’t supposed to handle too much or get too much flour mixed in but this dough seems to get easier to work with as you DO mix flour in. It starts a bit sticky so don’t be afraid to get flour on it. Here’s the recipe and I’ll explain steps along with the pictures. 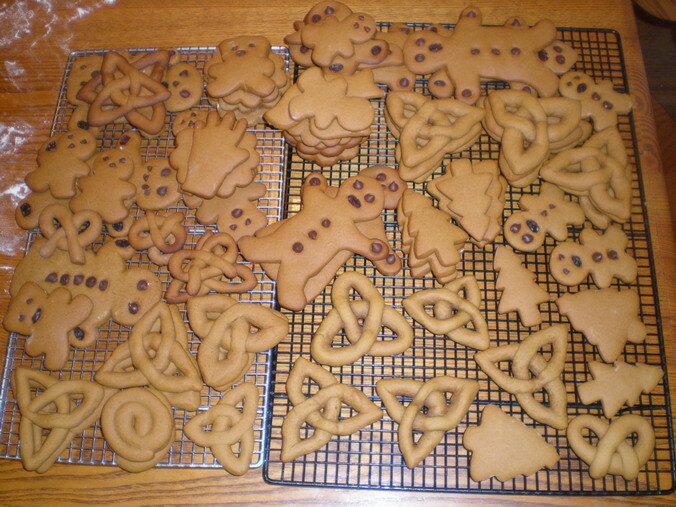 Gingerbread Cut Outs – 375 degrees. First let me say that this actually is supposed to be a SOFT gingerbread cookie dough, if you use 5 cups of flour and don’t change anything else, you’ll have a great soft cookie recipe. What I do sometimes is make it this way, take some dough out and put in a separate bowl then add flour to the rest of the dough to make cut outs. The soft dough you can add raisins, chocolate chips and or nuts to and just drop them with a teaspoon onto the greased cookie sheets. So you make one mess and have two kinds of cookies, my favorite kind of recipe! 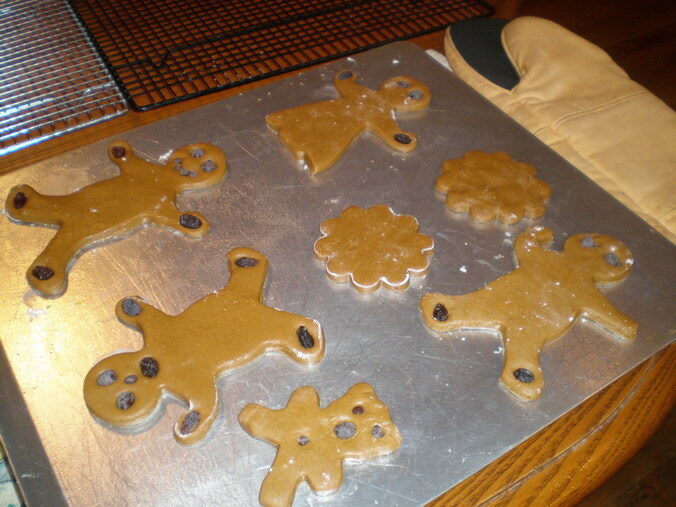 For cut outs (gingerbread boys etc) just add 6 cups of flour and later as you play with it add more as needed. What I do is test the dough by baking one cookie and see how much it puffs, if it puffs too much you loose the cut out look and means you need to add more flour. No big deal, just knead some in like you would with bread dough. As always, wash your hands well first, not just for germs but in case you have hand lotion on etc. it won’t taste nice in your cookies! I use my fingers to get the dough off the beater all the time, it’s just easier. You’ll also handle the dough to shape it. Make sure the kids wash up too if they’re helping. First mix the sugar with the molasses. I haven’t tried this with treacle yet, which is what our friends in the UK would use, I think you’d need to cut it with golden syrup. If I make them in England I’ll try it and let you know! You can use canned shortening or the sticks. 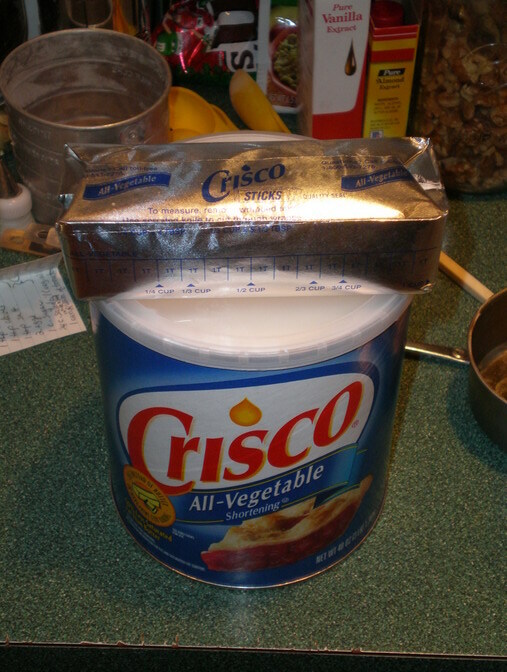 Cream the shortening into the sugar mixture, if you buy “Crisco Sticks” it’s one whole stick. I love these for baking because they’re so easy and minimize cleanup time. Add your eggs now and mix well. Just wanted to show you how weird it looks after you add the vinegar, this is normal! After you add the vinegar measure 1/2 cup of Hot water into a liquid measure cup, add 1 Tbsp of baking soda and mix it to dissolve. Add this to the cookie dough now. 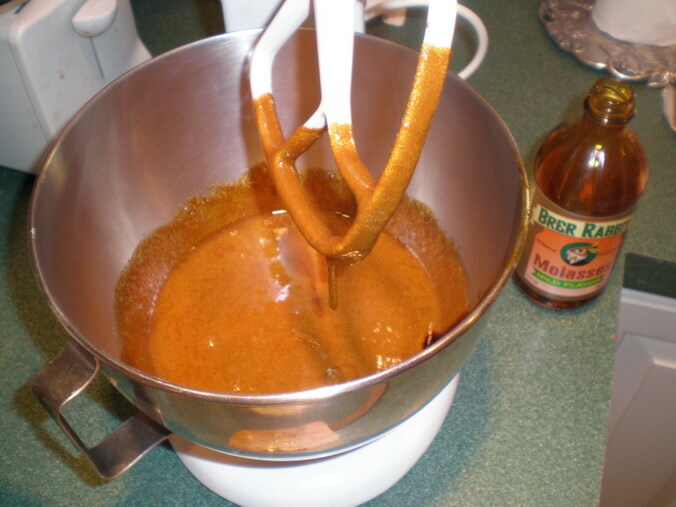 For the flour mixture, put your flour measured into a sifter then put the salt, ginger, nutmeg and cinnamon on top. 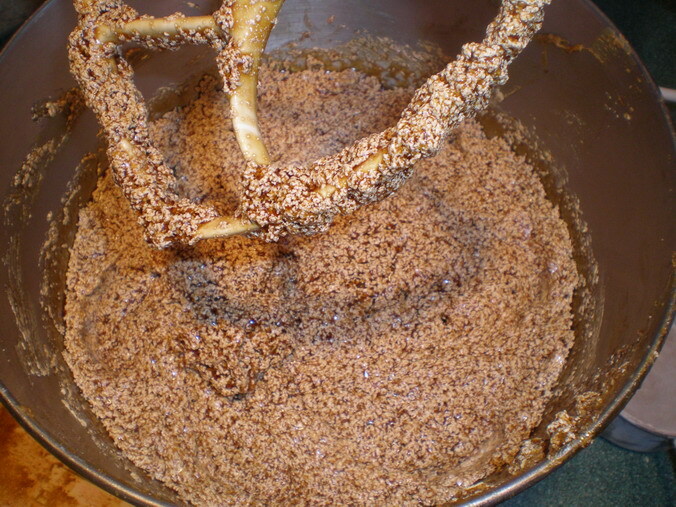 Sift this into a medium sized bowl to mix. Add by small amounts to the batter on slow (so flour won’t fly all over!) mixing well every time you add some. I lay a wooden cutting board or a hot plate on the table and cover it with two dishtowels to protect the table from the hot cookie sheets. Here’s my set up, one end of a cleared wooden table. Move all your junk, c’mon some of you must have stuff on your table like me! 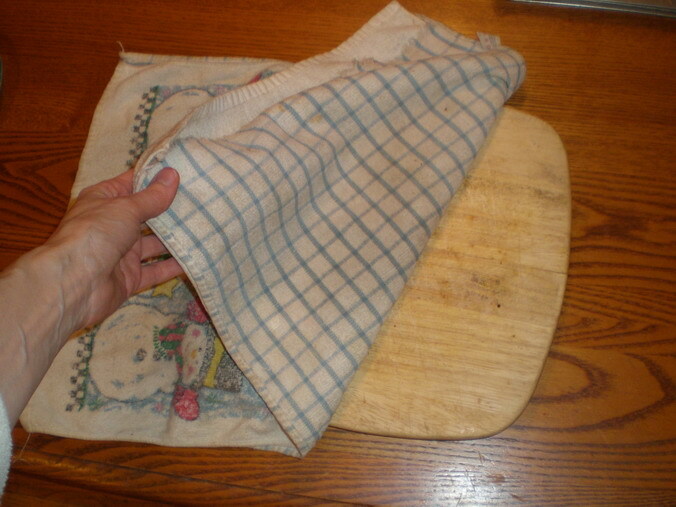 ; then clean the table surface with a damp cloth. 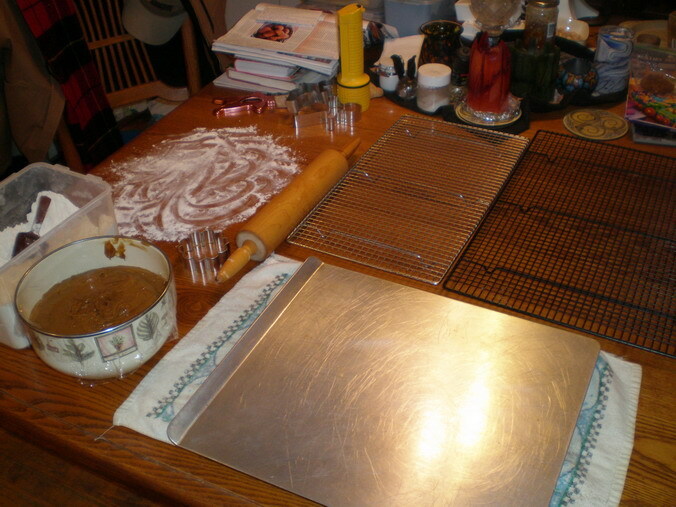 I keep the cooling racks right next to where the cookie sheets are so it’s easy to slip large cookies off. 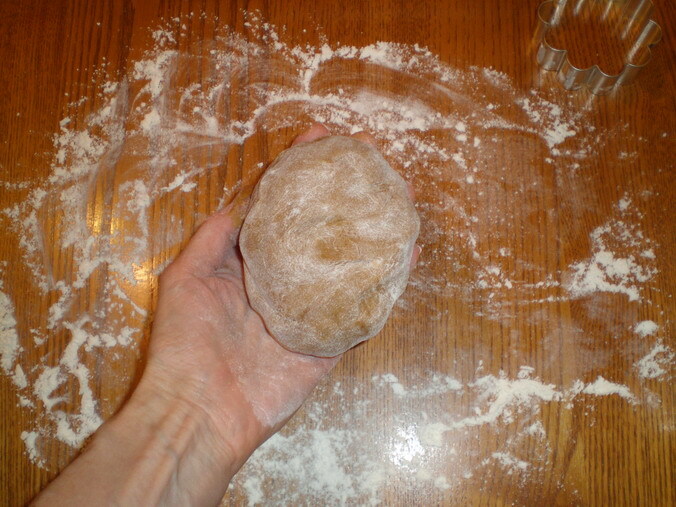 You don’t need a huge area to roll out the dough, you only do a small amount at a time. Scoop out some dough, if it’s very sticky just roll it in the flour and you can knead some into the dough right now too. Before I roll it out on the table I pat it in my hands to flatten a bit like a huge cookie. 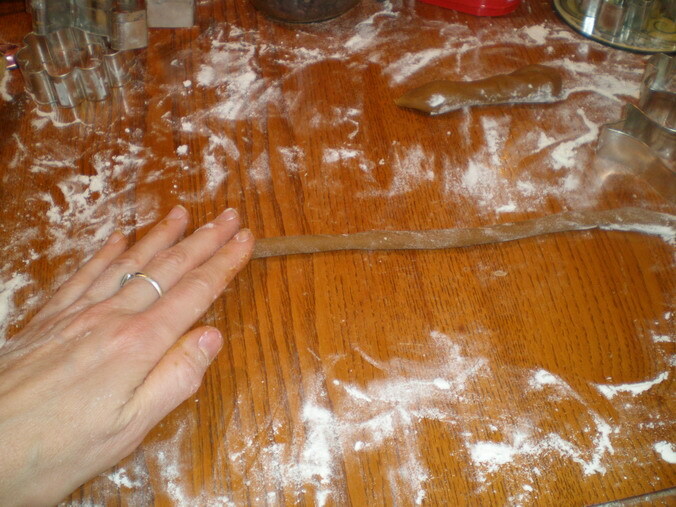 Then sprinkle flour on the table and plop the dough on the table, roll it a bit, lift it to make sure it’s not sticking and roll some more. Don’t be afraid to add flour to the table. 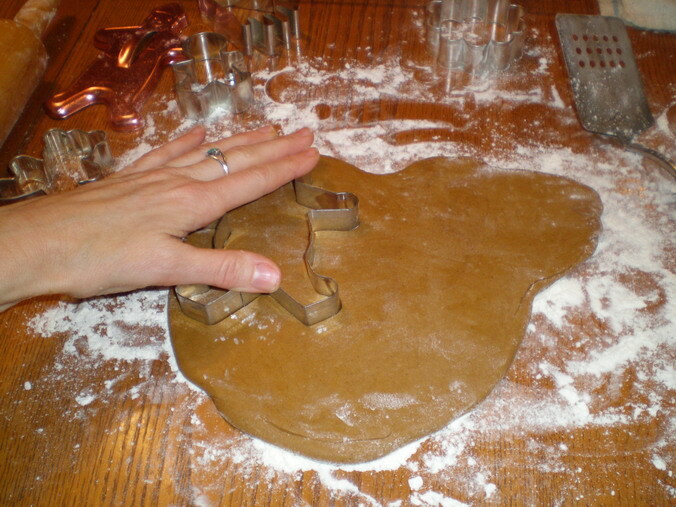 Rub your cookie cutter in flour then cut the dough, lift it up and if it doesn’t stick to the table it’ll lift with the cutter, just hold it over your cookie sheet and poke it out with your finger. If it sticks to the table that’s ok! 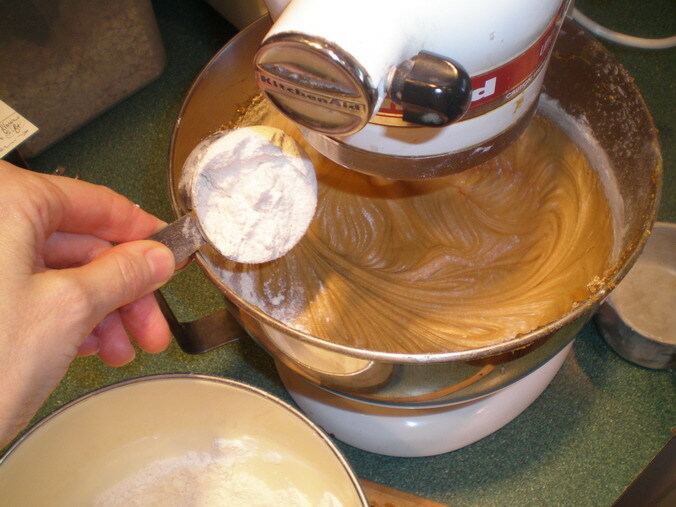 Just pull surrounding dough away, and either use your fingers to lift it or a pancake turner (spatula). I would recommend baking one cookie first to test the dough. If it puffs up too much you need to add more flour, just knead it into the dough as you go. Use a greased cookie sheet. 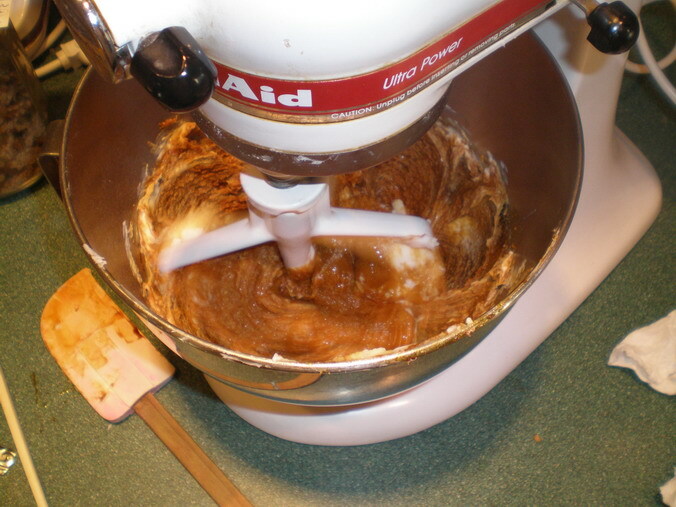 Press raisins, chocolate chips, nuts and whatever candies you want into the dough to decorate it. I love the chocolate chips with it! You can decorate with white icing after they are cooled too. 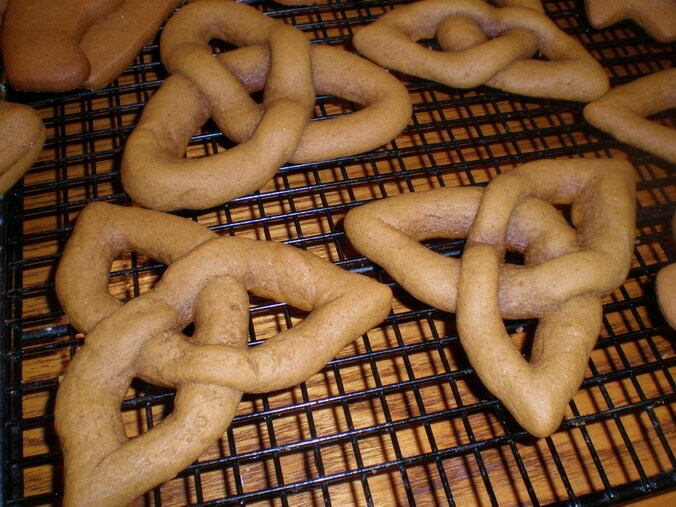 Bake at 375 degrees for 10 minutes , 5-6 for the small cookies and pretzel shapes. They will firm up as they cool. 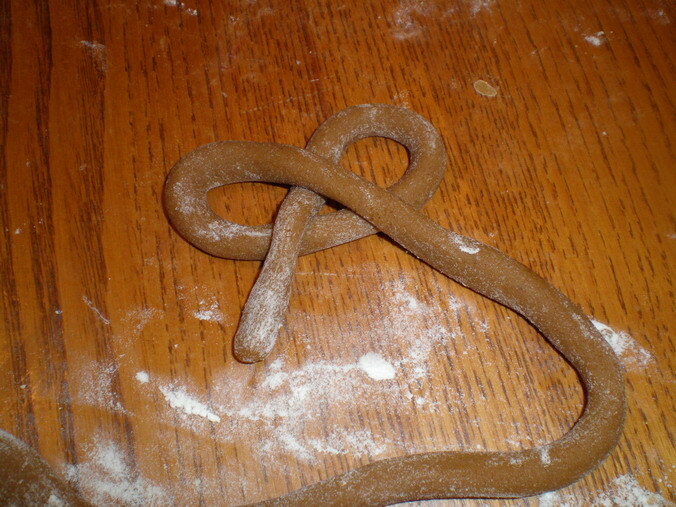 If you like a chewier cookie, keep them a bit underbaked and/or roll them thicker. Ok, the best part of this dough is you can play with it, perfect for kids! It’s very forgiving, if it doesn’t turn out, smoosh it up and try again. Remember playing with clay when you were a kid, well it’s just like that when you want to make a pretzel shape or Celtic Knot. I show doing it on floured surface but I found that rolling it on the greasy cookie sheet was much better and you don’t have to lift it after. So roll and shape right on the greased cookie sheet. Play around with it and trim the ends off. This is something I made up when my boyfriend saw the pretzel shapes and said they looked like Celtic Knots…the creative lightbulb went off immediately and I started creating these, Triskell Knots! Cool huh? 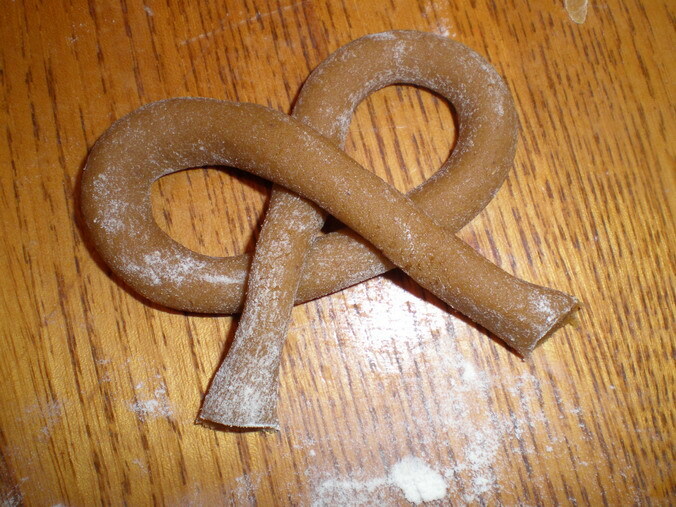 A little tricky to do…just play with it, it’s like making a pretzel but you close the loop on the third side instead of trimming it. A word of advice, don’t leave in the oven as long as the cut outs, these will bake much faster. Try 5-6 minutes. Wow look at all those cookies! Don’t forget to visit my fine art website www.marymcandrew.com to see my paintings. I have a store coming soon where you can order note cards, t-shirts, mugs, stickers…gosh the list is never ending! I’ll keep you posted.